Photo: Grace Place’s medical clinic in Honduras last year. Grace Place, a Church of God congregation in Hermitage, Tennessee, has long been known for its heart for missions and community outreach. 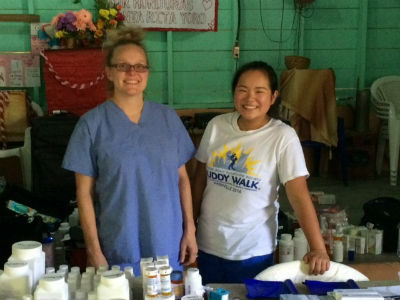 Last year was the first of what is to become an annual medical missions trip to Honduras. This year’s trip is scheduled to begin October 1. All the travel arrangements have been made and, except for packing suitcases and finalizing last-minute details, the team is ready to go. 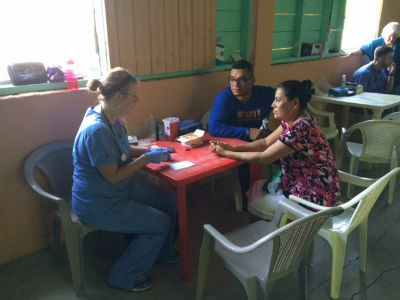 As part of the medical missions trip, the team brings along a prescriber—a professional medical staff person qualified to prescribe medicine to the people the team serves in Honduras. Unfortunately, due to a family pregnancy and recent auto accident, both their prescriber and back-up prescriber had to back out. Grace Place had a real problem on their hands. Honduras has had a special place in the heart of the Grace Place congregation since 2008 when they first started sending work teams. Through Heart to Honduras, they adopted the Santa Rita church about four years ago. Over the years, Grace Place has helped them construct their building and a water tower to support the village. Last year, they held their first medical clinic. When last year’s prescriber had to back out this year when he and his wife became pregnant, a physician’s assistant stepped up to fill the void. But recently this backup was in a car accident that left his rotator cuff torn and his shoulder badly injured. As a result, doctors would not give the all-clear for him to leave the country. Pastor Tommy Dove approached the congregation with the challenging news on Sunday, August 28. Of course, there were other hurdles that had to be crossed. This physician’s assistant didn’t have a passport, and the process for obtaining one isn’t usually very fast. But on Monday, Pastor Tommy opened an e-mail that said she’d been in touch with the appropriate agencies, and that she was guaranteed to have the passport in-hand just in time for the trip! “I’ve just been waiting for a place to serve!” was her exclamation. Wow, God. Wow. Thank you for answered prayer! This entry was posted in All Church of God, Southeast and tagged answered prayer, clinic, Grace Place, Heart to Honduras, Hermitage, Honduras, medical, Miracle, missions, nurse, physician's assistant, Tennessee, Tommy Dove, trip, work teams. Bookmark the permalink.